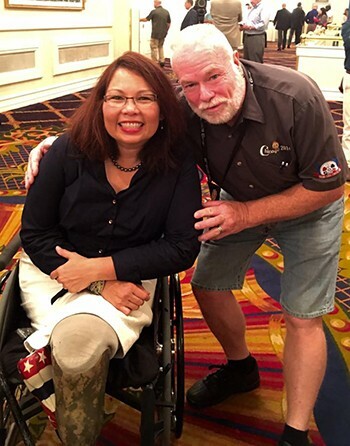 Chances are, Dave Roderick has met the next President of the United States. As he puts it, Dave has been “Woke” for a long time, since he was a teenager. And, in that time, he has pretty much seen everything and met everyone that has ever had a direct impact on the world that he’s lived in. He has met or personally knows every major political player in American politics today, from Republicans like Ted Cruz and Susan Collins, to Democrats and Independents like Elizabeth Warren and Bernie Sanders. He has worked with both Hillary Clinton and John McCain, who recently lost his battle with cancer after serving in the Senate for more than 32 years. 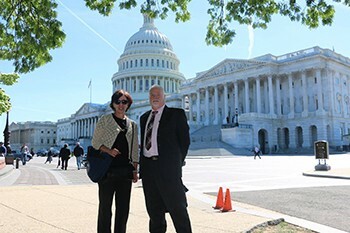 Not surprisingly, Dave Roderick’s years of high-level political activism have led to his becoming the Director of Legislation for IAM District 141. 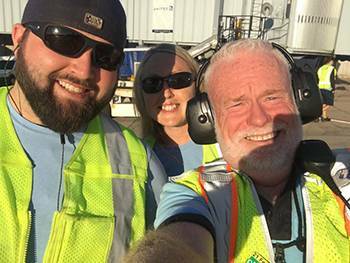 In this role, Dave is responsible for keeping public policy makers informed and educated on matters of importance to airline workers. In other words, he needs to keep our nation’s policymakers as woke as possible. The IAMAW, or the “Machinists Union” as it is called by many of its 600,000 members, is the largest collection of aerospace workers on the planet, with District 141 representing the largest single group of airline workers within the union. 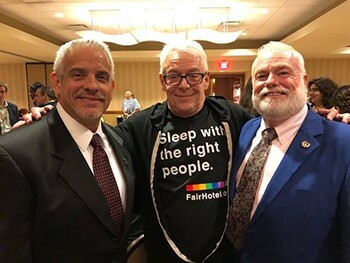 This year, Dave Roderick represented the 42,000 members of IAM District 141 at the Pride @ Work Convention, which seeks to build bridges between important decision-makers within the labor movement and the thousands of LGBT workers that are covered by union contracts in North America. The Pride @ Work Convention was held this year in Phoenix, Arizona. Dave is also the first openly gay Legislative Director in the history of IAM141. How did you get started as an activist for LGBT issues? Since about the time I was 15 or 16. I don’t think of it as working for “LGBT” issues as much as fulfilling my social responsibility. When I was younger, I mostly worked as an ally for persons of color, for example. This eventually led me to work within the Equal Rights communities, which led to LGBT activism. I’ll always be interested in human rights. I was lucky to have had the opportunity to study this topic at the Winpisinger Center, which our union operates, and provides trainings on how to be more effective as a human rights activist. There were still major race relations problems in 1973 within my Hammond, Indiana high school. Our focus was to try to get ALL students together, so we held daily meetings during the lunch periods. In an unused conference room we played “albums” for students to enjoy and dance to. Unfortunately, it didn’t work as planned. We had a good number of people in attendance, but not enough white people. We tried to reach out to white allies, but we never attracted more than a handful. Allies are critical because that’s the only way a minority community can reach majority support. But, this was high school. We were kids. What are some of the things you’ve accomplished since then? My involvement had always been in the political field. We’ve participated in so many events, I’ve just lost count. One notable program that I’m pretty happy with are the sessions with my community Congressional Representatives. We use those to discuss concerns in the LGBTQ communities. Through the Machinists Union, District 141 and my home lodge in Chicago, Local Lodge 1487, there are many programs available for those of us that want to get involved. All you have to do is show up, and be ready to help out. That’s the thing about unions. They’ve always been advancing equality for all. The IAMAW’s William W. Winpisinger Center in Hollywood, MD, has well-developed educational programs and classes to assist our union leaders. This includes their very active Human Rights classes, and Human Rights Department, which is now headed by Rhonda Rodgers at Headquarters. Young activists and veterans alike can find a role, whether it’s planting yard signs, fundraising, or taking on a leadership role. Can you say something about your experience working with Pride@Work so far? We are just beginning our relationship with “Pride at Work,” although the organization has been around for some time. P@W is guided by the AFL-CIO, and involves over 20 chapters and union affiliates. It allows us to be leaders and to assist LGBTQIA+ members who are at-risk of mistreatment in the workplace. As union members, we should be proud of the work that we’ve done on behalf of the LGBTQIA+ community. In states that don’t have explicit legislation protecting the Queer community, the union contract might provide the only legal protections that exist for these people at work. It’s critical that we make sure those contracts and union benefits are reaching everyone. I am very proud to say that IAM141 President Mike Klemm felt that our district needs to be involved and participate. His support is critical, and very much appreciated. President Klemm thinks it’s past time for union members to make sure that worker’s rights are reaching all workers, and I couldn’t agree with him more. I have the highest respect for so many people within my union family who have encouraged me to be who I am today. I am so appreciative of the work that my Chicago Local 1487 has done under the guidance of Tony Licciardi. Tony has worked hard to make sure that all groups within our union are represented. Monica Silbas, the Assistant Legislative Director for the IAM, was one of my first mentors when I was just getting started in union activism. Her work in Women’s Rights, Workers Rights, Human Rights and LGBT equality has been profoundly inspiring to me. Chris Wagoner, the Director of the Winpisinger Center, which I mentioned earlier, and his team at the harbor are a phenomenal resource to anyone in our union who is interested in serving the membership and their communities. 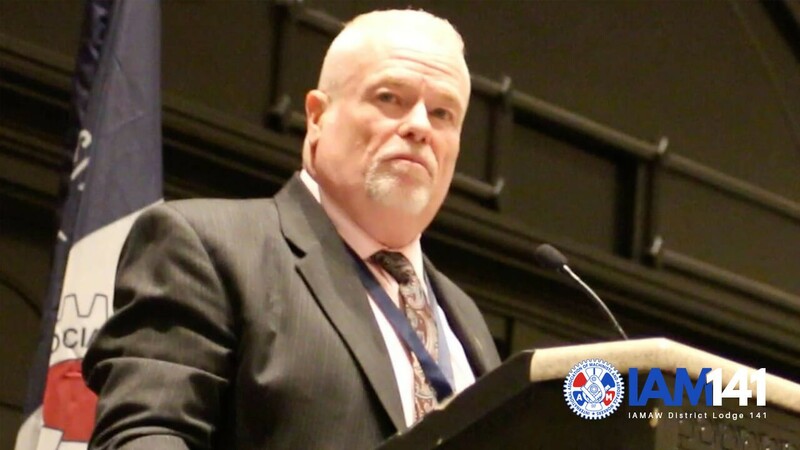 Plus our own DL141 President Michael Klemm who continues to ensure that our union is inclusive of all. There are many ways to get actively involved in the union’s work. There is one area where we have a lot of work to do, and that is fundraising to support our allies in elected office. Federal law prohibits unions from using money from dues to support political candidates, so we rely on voluntary contributions from IAM members to the Machinists Non-Partisan Political League (MNPL). We will never match the huge sums of money that Corporate PACs funnel to anti-union politicians, but we can pool small contributions from members to support candidates and officeholders who support organized labor and all working people. As we have learned on our shop floors, the best way to advance the priorities and values of our union members is by combining our human and financial resources to realize the true power of collective action.